UNLIMITED DRAFT BEER ON TAP. Imagine your local eat-all-you-like buffet announcing such a thing on the menu. How the queues would stretch down the high street. In the UK, the very existence of such a place would be a scientific impossibility, a rip in the fabric of the time-space continuum. The beer would be gone in literally minutes. Tucked underground at Xidan (Sheedan), Beijing’s popular shopping area, is a vast restaurant space with room for at least a couple of hundred people, sitting at long tables, and surrounded on all four sides by piles of really good food and the aforementioned (not bad) lager on tap. It’s like being in some sort of Roald Dahl book. Or the Yellow Submarine. Or that scene from Magical Mystery Tour, where the aunty is fed buckets of spaghetti (if you made it that far through the movie). Anyway….you pay your 40 kwai (slang for Yuan) – about £4 – and sit down. Your get an individual hotpot (traditionally you share one in the middle of the table). Then you go get your raw vegetables, tofu, meat, seafood (all fresh) and several beers. 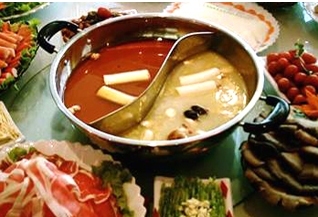 Hotpot is a Northern Chinese / Mongolian thing, a continuously cooking pot of soup, flavoured in various ways. You put your vegetables , tofu and meat in bit by bit, and eat it as it cooks, dipping it in a peanut, garlic and coriander sauce. It’s very sociable, you can’t scoff your food quickly and bugger off. Bloody hell, it’s good. By the time you’ve eaten, you’re hungry again, a sure sign that you have indeed entered a new dimension. It feels like you could sit there eating forever, enjoying the surroundings of this strange new universe, with the occasional visit to the loo. There is a drinking culture here, but it’s nothing like back home. There are very few pubs and bars, they are all concentrated in one or two nightlife areas. No one makes a point of attending these buffet restaurants with the sole intent of guzzling the bar. Maybe I’m pointing out the obvious (again). You just couldn’t run this kind of thing in England. Anyway, me and a bunch of (mostly Western) friends are going to go there quite soon. I hope our behaviour doesn’t make them change their ‘unlimited beer’ policy. Maybe they’ll just ban foreigners instead. We moved into our new flat in Fuxingmen in February. It’s pronounced Fooshingmun, and ‘men’ means gate, or door. Metro Line 2 is like London’s circle line, and nearly all of its stops end in ‘men’. Next stop is Fuchengmen. Viz readers should live around line 2. These ‘men’ are the old gates to the city. In the middle you have Tiananmen, which roughly translates as Gate of Heavenly Peacemaking, although its a slightly different meaning to the literal gates around the Viz line. Of course Beijing has grown far beyond this old border now, but the road layout and place names still show the history. 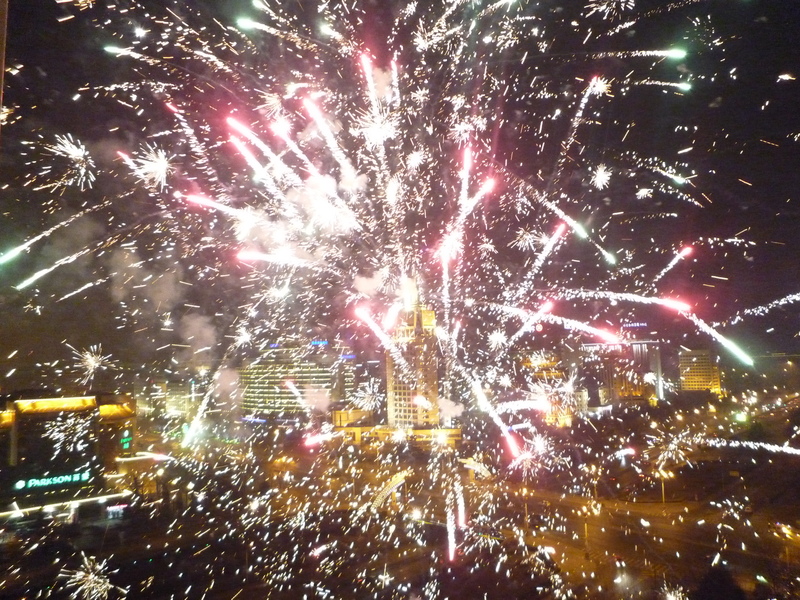 Our new home is on the 18th floor, and we were just in time: Chinese New Year arrived, with shock and awe resembling Baghdad ’03. I’d been here the year before for New Year, and I knew how much the Chinese like to let off fireworks. But I was low down in the Hutongs then – this time I had a great view across the city. The fireworks lasted for two days without a single letup, and then on and off for the rest of the week. The night time sky was orange, and the noise was incredible. Some were going off nightly and daily (why???) right outside our window. The Great Worrier thought the glass was going to give in at any moment. 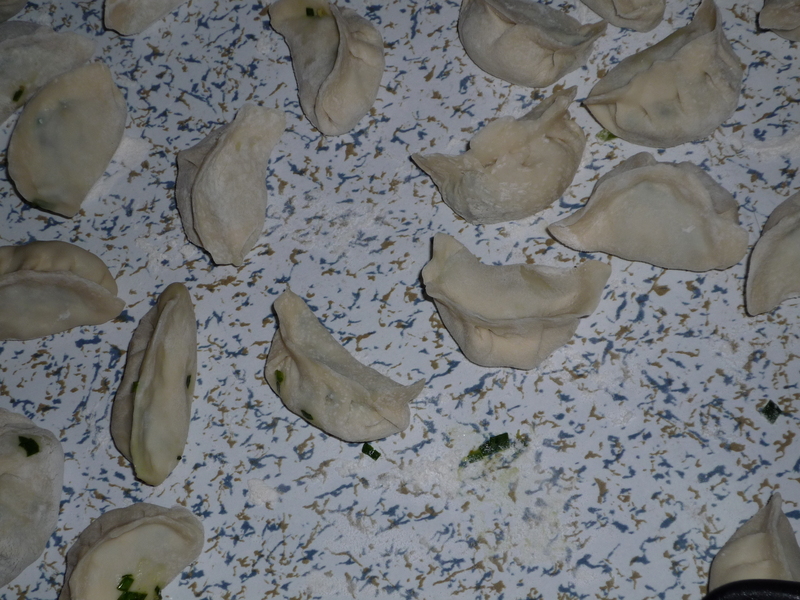 Traditional new year food is Chinese Dumplings. Along with Hot-Pot (too good, needs a book written about it) these really should make an appearance in the UK, and kill the image of Chinese food as nothing but greasy noodles, egg fried rice and prawn crackers. I don’t know where that UK Chinese takeaway food comes from. Not had anything remotely like it here yet, that’s for sure. The dumplings are not English style dumplings, they are more like large Italian Ravioli I guess, with a multitude of excellent fillings. You stand around a table covered in flour, making them together, talking about the weather or the price of tofu, pinching the sides to seal them up like little cornish pasties. Then they are fried or steamed, and you dip them in soy sauce, chilli and vinegar. Or ketchup and brown sauce if that’s your thing. Then you just keep eating. When you finish eating, you cook some more and eat them. When they are done well, they’re addictive. Tried to buy frozen ones. No good. When the day’s eating is finally over, like all good family festivals, you sit round the telly for some good wholesome entertainment. 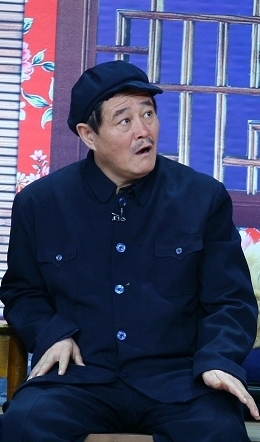 In the evening there are huge variety gala shows live on TV, featuring comedy sitcoms performed on stage, with singing, dancing and magicians. Not really my thing, and not just ‘cos I can’t speak Chinese. It all looked a bit dated to me, but the staging is impressive, the numbers of performers make it some operation. Its very popular. I am assured that it is required viewing, a tradition just like Xmas Wizard of Oz once was. Maybe Saturday night with Jim Tarbybruce and the London Paladium is a more apt comparison, although I’m sure the jokes are better.